Pierre Lamielle is a man of many talents, and he’s using them to make us hungry. Pierre’s the Calgary chef, illustrator and writer behind the funky (and funny) cookbook, Kitchen Scraps. When the temperature dipped to “This cold makes me want to die” last night, I decided to make some comfort food. And I could think of nothing better than pasta. I discussed this idea with my lovely friend Sam, who was also into the idea of curling up with a bowl of pasta goodness. She offered to pick up the groceries; I offered to cook. We were on our way. The only thing left was to choose from Pierre’s hearty recipe collection. Flipping through Kitchen Scraps, which is divided into sections based on how the food should be consumed (with a spoon, fork, “forkenknife” or “a hand”), I came across a recipe for angel hair pasta. He had me at, “Making dinner is fast and easy with this recipe, which turns light delicate pasta into something rich and luxurious with just a few simple ingredients.” Um, yes please. Here’s how you make it, taken straight from the “Food you eat with a fork” section. Make sure you have all your ingredients in place before you cook the pasta, because you will need to work quickly once the pasta is drained. Bring a pot of water to a boil, using lots of water so the pasta doesn’t get tangled up — you want to avoid a bad hair day. Salt it heavily. Cook the pasta, and taste for doneness after 4 minutes. If it isn’t al dente, check frequently until it is. Drain the pasta in a colander, setting aside some fo the cooking water. Get the pasta right back into the same pot. Return the pot to the same element, but turn it off. (The remaining heat will cook everything through.) Now quickly add the yogurt, garlic and olive oil, tossing gently until the hair is evenly coated and luxurious. Add some of the cooking water if you think the sauce needs it. Finally, toss in the Asiago and lemon juice (*plus any other ingredients he suggests, such as lemon zest, thin strips of prosciutto or arugula) and stir until just the cheese is incorporated and starting to melt. Salt if needed. Get a big tong full of hair into a big bowl, then top with loads of fresh-cracked pepper. 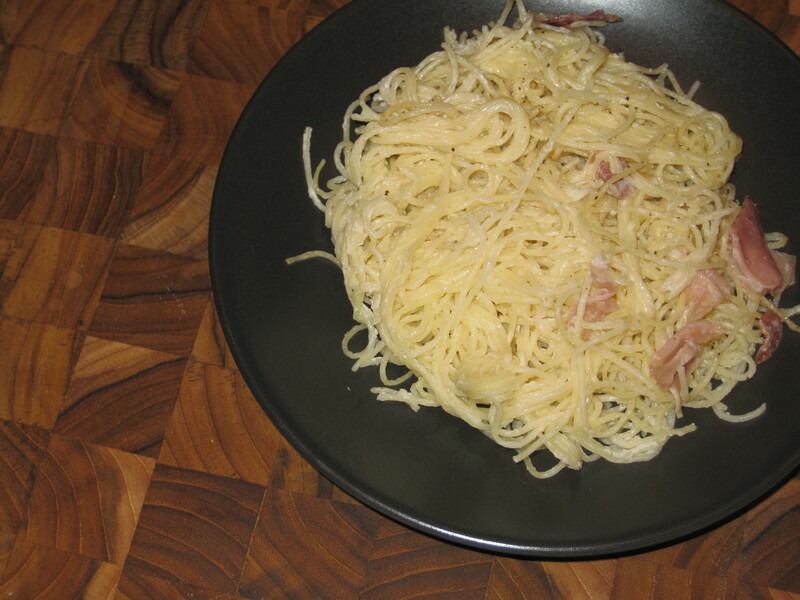 I followed Pierre’s recipe and added some thin strips of prosciutto because I have a mild obsession with the stuff. The result? Very, very tasty. The pasta was creamy without being unhealthy and the lemon, cheese and prosciutto gave it yummy flavours. There was, however, one problem with this recipe. It smelled so damn good that we devoured our two heaping bowls of pasta in a hurry — long before I remembered that I was supposed to be taking pictures of the cooking process. Oops. I wish I could show you pictures of the finely grated Asiago cheese, the meaty strips of prosciutto and the pot full of pasta when it all came together. Instead, I offer you this — one measly shot of the paltry leftovers. I’ll do better next time.